BANGKOK, Thailand -- There’s a reason why Korean game makers are foraying into Thailand. The Southeast Asian nation’s game market is currently valued at 500 billion won ($445 million), with an annual growth rate of 20 to 30 percent indicating strong buying power. Netmarble Thailand accounts for 3 percent of the total annual revenue of Netmarble, one of the early Korean pioneers in the Thai market. The Korean games company recorded 2.4 trillion won in revenue in 2017. 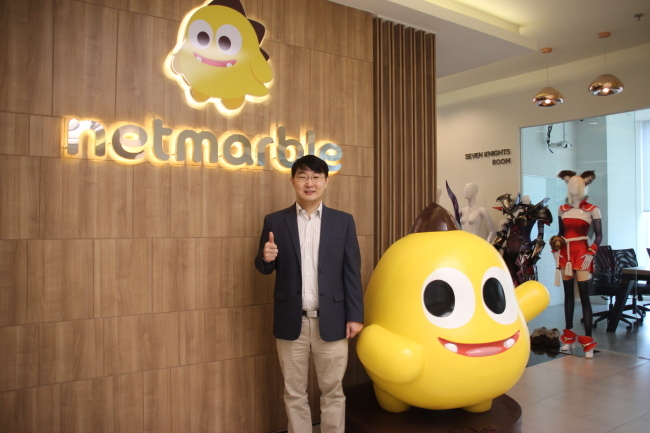 “The figure should be 5 percent, given that the full potential of the Thai market has yet to be tapped,” Netmarble Thailand’s CEO and Managing Director Kim Gun-woo said in an interview with The Korea Herald at his office in Bangkok. Netmarble Thailand -- established in 2012 through Netmarble’s acquisition of Kim’s game company Stand Best Tech in Thailand -- is one of the two Southeast Asian branches of the Korean game maker. The other one is Netmarble Indonesia. Going global has long been a business strategy for Korean companies seeking new markets amid the heavily regulated domestic market. The tactic has served Netmarble well -- it was the only Korean company to be named among the top five global mobile game firms by volume of consumer spending on the App Store and Google Play, in rankings compiled by App Annie, a mobile app market analyzer. China’s Tencent and NetEase, US’ Activision Blizzard and Japan’s Bandai Namco ranked above Netmarble. Among Southeast Asian nations, Thailand stands out to game companies for its relatively dense network infrastructure, mobile device penetration and consumers’ openness to different games. “Southeast Asia has a low rate of credit card usage. But since third-party transactions, such as Google gift card, became available for in-game purchases in Thailand, gamers’ purchasing power has risen,” Kim said. In December 2018, esports was recognized as an official sport by the Sports Authority of Thailand. In the Asian Games held that year in Indonesia, esports was a demonstration sport that will be upgraded to a medal sport in the 2022 games. However, business isn’t always rosy in Thailand, as games have difficulties setting sail without a comprehensive understanding of culture and characteristics of Thai consumers. “The key lies in understanding the nature of the users,” Kim said. Therefore, marketing and relevant events with big local brand names to keep games appealing to users are crucial to Netmarble Thailand. Netmarble clinched the mobile best game award at the Thailand Game Show Big Festival for four consecutive years, beginning with “Everybody’s Marble” in 2014 and 2015, “Seven Knights” in 2016 and “Lineage 2 Revolution” in 2017. Kim has vowed to maintain Netmarble Thailand’s leading position in the face of strong contenders such as the popular “RoV.” Chinese mobile games developed using Korean original intellectual property, such as the mobile version of Korean PC offerings “Player Unknown’s Battlegrounds” and “Scions of Fate,” are other games Kim keeps an eye on. In addition to Netmarble Thailand, Netmarble has seven other overseas branches in North America, China, Japan, Taiwan, Thailand, Indonesia and Turkey. It will continue to expand to more locations with potential. Netmarble has thrown its hat in the ring for bidding to acquire Korea’s biggest game company Nexon. Nexon’s office in Thailand is located in the Huay Kwang district in Bangkok, close to Netmarble Thailand.